The Red Hook-ish corner plot where Hamilton Avenue meets Summit Street in Brooklyn has long been commanded by an old industrial shed made of sheets of rusted corrugated metal. For a long time, the shed was filled with old cars and the land around it overgrown with weeds. In the past year, the cars and weeds have been cleared out, but the shed remained as ugly as ever. Now it has become the home Liberty Sunset Garden Center, which recently left its home further south in Red Hook. The land surrounded the shed is now a lush forrest of greenery, instantly changing the address into a sort of beauty spot. The area has a wealth of garden centers. In addition to two along Van Brunt Street, Gowanus Nursery is virtually around the corner from Liberty's new location. Lost City Asks "Who Goes to Villa Berulia?" Readers have been urging me to make Villa Berulia in Murray Hill the subject of a "Who Goes There?" for more than a year. I finally made it there this week. I'll have to go back to get that Dalmatian stew. 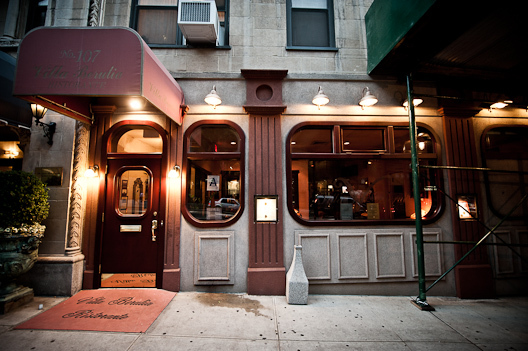 Villa Berulia, a white-tablecloth, lunch-and-dinner Italian restaurant run by Croatians, has been gathering little attention and much moss on E. 34th Street near Park for 30 years. Hiding in plain sight behind an almost anonymous facade, it's family run, and beloved by the older members of dignity-starved Murray Hill. Labels: Murray Hill, who goes there? 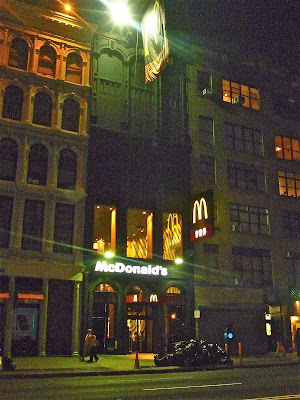 Why is the McDonald's on Canal Street paint pitch black? A subtle message to those who would consider eating there? The Clover Grill, in the French Quarter, looks the kind of new diner that intentionally tries to look older than it is. The details just seem too perfect. But it actually is an old joint, founded in 1939 as far as I can tell. It advertises "world's best best hamburgers." Now, that's chutzpah. Even in New York, places just vie for the best burger in the city. Apparently, they're cooked under a hubcap in order to keep up the juices. What would the NYC DOH say about that? 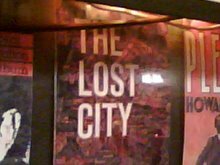 Lost City Asks "Who Goes to Randazzo's?" Randazzo's Clam Bar is one New York eating institution that hasn't become a caricature of itself. It's talks like a Brooklyn clam bar and walks like a Brooklyn clam bar. May it ever do so. "This is the only place I'll eat raw clams," said the reedy man in the red t-shirt. In a Quentin Tarantino version of "Gilligan's Island," he'd play the title character. "People forget there used to be three Randazzo's." The cute cashier, dressed in sweat pants and a t-shirt bearing the Greek letters of a sorority, looks up, as if in response to a favorite topic. "This was the straight clam bar. Then there was a sit-down restaurant next door. And a surf and turf place. And they were always packed." Labels: randazzo's clam bar, sheepshead bay, who goes there? 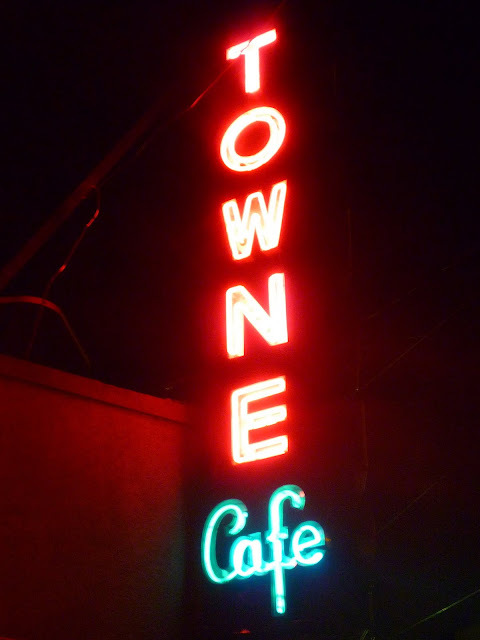 A couple months ago, I expressed concern that Shoolbred's, the bar that occupies that space long held by old-school, East Village Chinese institution Jade Mountain—wan't taking care of the old "Chow Mein" neon sign that still hung from the second floor. The lights, long ablaze, had gone out, depriving the community of a lovely visual delight, as well as a link to history. Now comes more disturbing news from EV Grieve. The sign is gone completely. There's construction netting over the old building and work is being done. That's the obvious reason the sign was removed. But will it be returned? "Spoke to Dean Maroulakos the General Mgr of Shoolbred's and Ninth Ward today. He asked that anyone with historic/preservation concern for this sign please contact him through email at info@ninthward.com or call his cell 646 275 0461 so he can direct you to the landlord." That would sound like the sign is not coming back, which would be a crying shame. But at least it may be preserved. It's very probably the last of its kind in the City. Found this page of ads in an old theatre magazine from the late 1940s. My choice? As much as I like me some frogs legs Provencal, I want to go "where the cast and audience meet and act like gourmets." FYI, the location of the Normandie Restaurant is now a parking lot. The China Clipper was supplanted by a shiny skyscraper. And Melody Lane is now the site of Fox News. From Chelsea to Riverdale. It's what it's all about, man. Or, it was. Es' Shoe Repair. 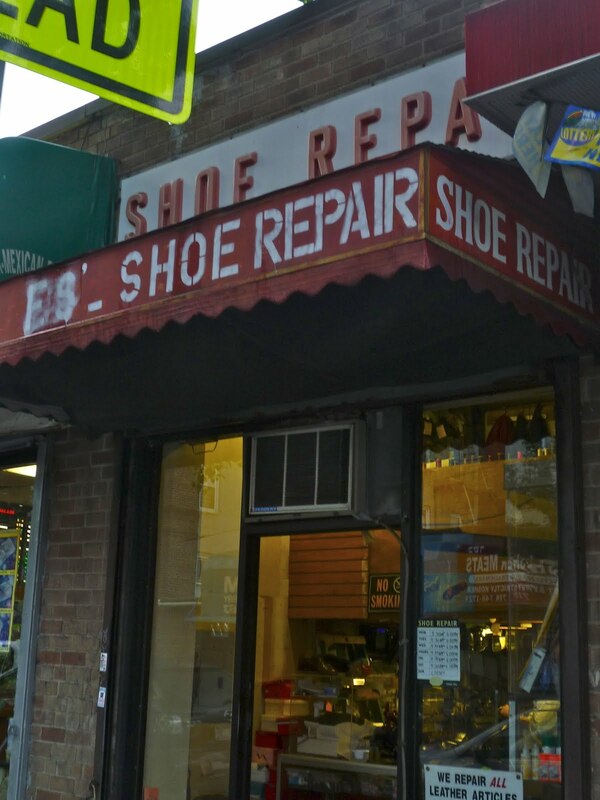 You expect shoe repair shops to be small. But this one in Riverdale also has a small name. Es? What kinda name is that? First name? Last? Nickname? Short for something? Caught sight of this extraordinary sign as I was driving out of Philadelphia. It's actually not in Philly, but across the Delaware River in Cherry Hill, NJ. It's been in business since 1947. The store itself is one of those sinister, low-bodied, white, windowless jobbies. I while back, I wrote something about Steuben's, a mini-chain of Germanic bar and restaurants. One location used to be a staple around Times Square. 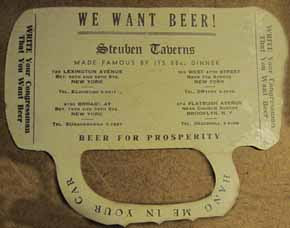 A reader saw it and sent me these images of a Steuben's souvenir "car plaque." You were evidently supposed to "hang this in your car." The reader rightly assumed the object came from before Prohibition. Like, right before Prohibition. "Write your Congressman that you want beer," charges Steuben Taverns, which were "made famous by its Beer Dinner." 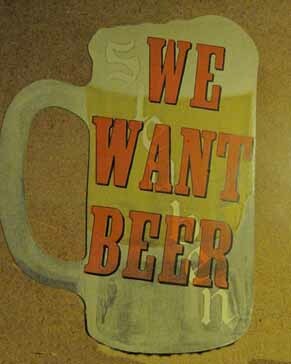 It also cheers for "Beer for Prosperity." Steuben's lost the battle, obviously. But someone managed to stay open until Repeal and long afterwards. I love it when readers send me stuff! UPDATE: A reader writes "This is from the New York Beer Parade, May 14, 1932." So it not from before Prohibition, but from the tail end of Prohibition. Nearly two years ago, I posted an item about this fantastic painted ad in Ridgewood. I had initially thought it was genuine. 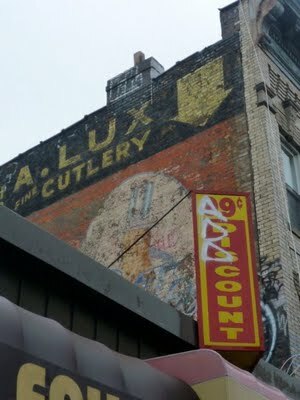 But then I found out, via Forgotten NY, that it was painted in 1985 as a backdrop for the film "Brighton Beach Memoirs." Well, turns out I was half right. The Planter's Peanuts part was painted for the film. But the stuff up top, about A. Lux Cutlery, is real. Writes a reader: "Lux Cutlery was actually located in that building. 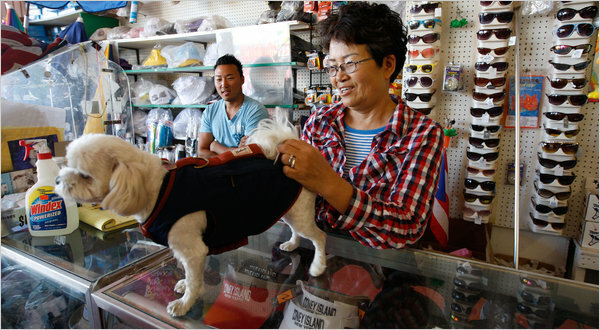 The owner was the second generation in that business. He retired shortly after the movie. They supplied knives to members of the NY Meat Cutters Union." When it comes to New York history, you never stop learning. 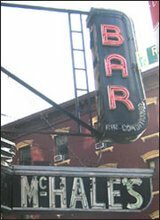 There's been a tidal wave of coverage about the recent closing of the East Village dive Mars Bar—more tears were shed over the beloved dump than were over Yankee and Shea stadiums combined. I hardly need to add to it. I actually paid my final respects to the place weeks ago. It was touch and go there for so many weeks; nobody knew exactly when it would shutter. So I just went in one night and pretended it was the last night. 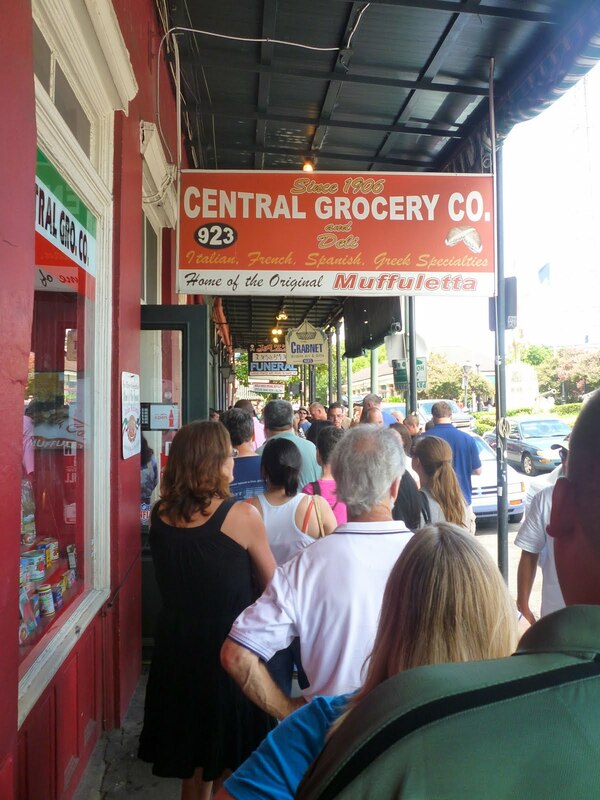 The wait for a Muffuletta sandwich at New Orleans' legendary, 105-year-old, French Quarter institution Central Grocery can be long, as the line above attests. But it need not be an ordeal. It's name notwithstanding, the shop is far more famous for its monster sandwiches—which are made on an entire loaf of round, seeded, Italian bread the size of a long-playing record—than for its groceries. But there are still a great many groceries on its shelves, many of them of Italian origin, many local and quite a few of them obscure. This makes for interested browsing as the line for Muffulettas snakes through the aisles. This is sort of a "Union Street Project" update. Just found out that Yorkville's wonderful Hungarian Meat Market has shut down, victim of a fire that broke out on June 17. Didn't see much about this in the news. "Due to an unfortunate fire accident, our store on 2nd Avenue is temporary closed!," reads the store's website. "We are going to reopen after the remodeling of the store, probably around September." The store is on 81st and First, a living reminder of the big Hungarian population that used to crowd Yorkville around 79th Street. It traces its history back to the 1950s, though it doesn’t look very old. You can get your Tirol salami, Csabai smoked sausage, and Szekely Goulash here, as well as authentic Hungarian paprika. 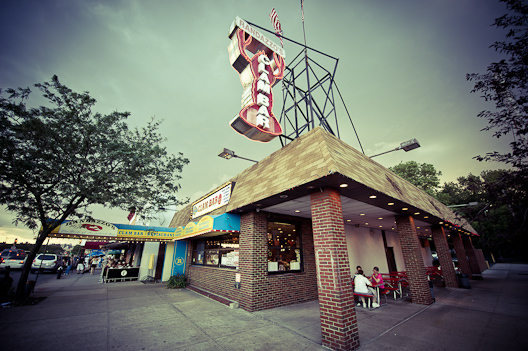 Sometimes, I suffer from bad timing, and don't get to visit a classic New York institution before it bites the dust. Not in the case of Leske's Bakery, the last Scandinavian bake shop in Bay Ridge. I checked it out last March. I was sadly informed by a reader over the weekend that the store closed soon after, on May 29. There was apparently an issue with the lease. This reader told me: "When I was growing up in the 60's, Leske's was one of the three Scandinavian bakeries in the area. 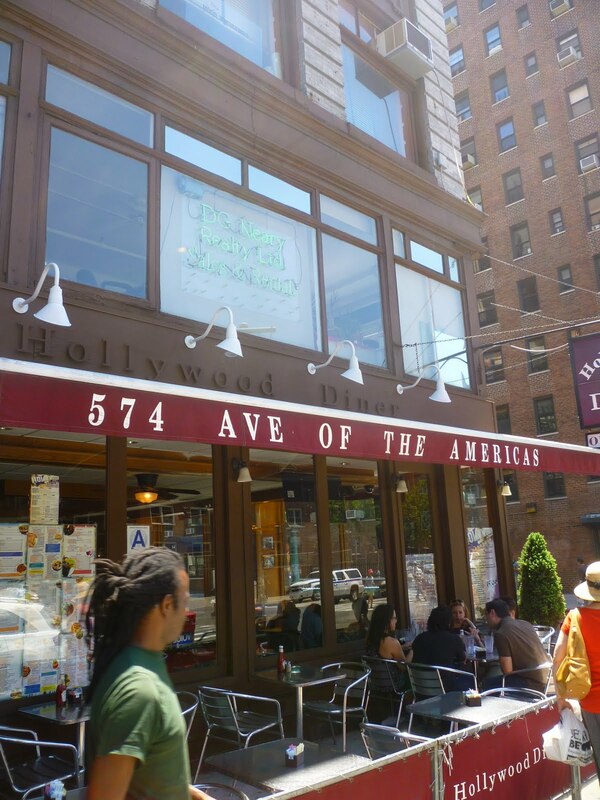 The other two were Pettersen's and Olson's on 8th ave. They were Norwegian bakeries." All our gone, now. Very few vestiges of the old Scandinavian community left now. 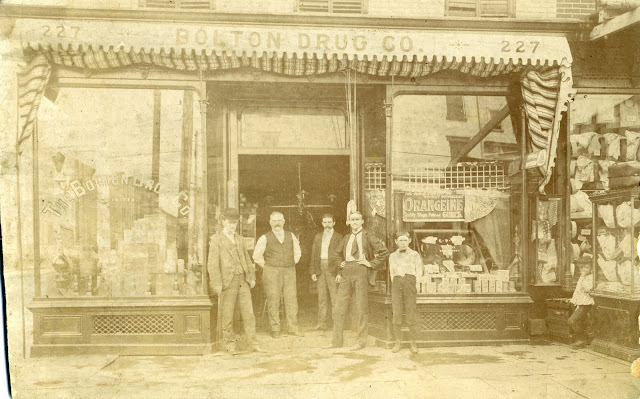 This is the twelfth post of "The Union Street Project," in which I unearth the history of every building along the once bustling Brooklyn commercial strips of Union Street between Hicks and Van Brunt, and Columbia Street between Sackett and Carroll. Today, 110 Union Street stands at the southeast corner of Union and Columbia. Prior to the 1970s, this address did not exist. The building on that corner had an entrance on Columbia, not Union, and was first (in the 1850s) 201 Columbia, then later in the 19th Century 227 Columbia. As the picture from the 1940s below tells, the corner was the home of Brody's, which looks like it was a lovely little luncheonette and soda fountain. Upstairs was a dentist equipped with a x-ray. The odd rectangular outlines between the second-story windows make me think the building was festooned with advertisements at an earlier time. I have been told by many that this corner was also the site of a vegetable market for many years, but nobody remembers the name, and I haven't been able to confirm it through any hard evidence. 1898, 227 was the location of the Bolton Drug Co., which had four Brooklyn locations. They heavily advertised a wonder drug called Mi-o-na in 1902. This building and the one next to it no longer exist because their foundations were destabilized during the great Columbia Street sewer dig that blighted the area in the 1970s. Some people say the City let the construction drag on as a way of undermining the crime culture that then ruled the area. Many old buildings along Columbia either fell down or were ripped down as a result, and the apartment building that houses Union Max was erected in the 1980s. It's bland and dull. Tops in both tacos and Chinese food!? How do they do it? How About That Soeller Building! Of all the crazy, patchwork edifices in New York City, the Soeller Building on Sheepshead Bay Road must take the cake. Believe it or not, that pell-mell collection of facings and facades is a single building. The Soeller Building, as a matter of fact. Look beyond the layers of different color paint and aluminum sidings and you'll spy common brickwork. The much-loathed 360 Court building is finally finished, and thus the southern entrance to the Carroll Street F line subway stop may now be used again by the public, and not instead function as a construction site for a millionaire developer. We only had to do without the entrance for two years. But, in reality, the interval felt like......two years. The building itself looks like something you'd see in Tribeca. And, no, I don't mean that as a compliment. It's not an absolutely awful building. But it just doesn't belong in Carroll Gardens. There must be about 1,000 pizzerias in New York City. I've clapped my eyes on a fair share of them. But I don't think I've ever seen one with the particular focus of Sheepshead Bay's Delmar Pizzeria, which has been around since 1957. "Specializing in White Cheese Pizza," proclaims the old sign. White cheese pizza. That's a very particular thing to hang your hat on. I, of course, had to go in and try said slice after I saw that sign. Well, it must be good, because they were out of white slices. From what I hear, ricotta is spread thinly where the red sauce would be and then topped with mozzarella. And the crust is crisper than your usual Brooklyn pie. I didn't have time to wait for the next pie to come out of the oven, so I went on my way. The revelation of Delmar's white pizza will have to wait for another day. If anybody needed proof that the company, which goes by the nauseating name of Central Amusement International, was going to get it wrong, the New York Times has very helpfully provided solid proof. CAI is going to shut down Ruby's Bar & Grill and six other Coney boardwalk attractions this summer. Why? "We will never make Disney here," said Valerio Ferrari, the president of CAI, seeming to indicate that Disney is a desirable goal. "But it will be something more...refined, cleaner. A little more year-round, if it’s possible, with sit-down restaurants and sports bars." Refined. Cleaner. Sit-down restaurants. Sports bars. Need I say more? He grasps the essence of Coney Island just about as well as cats grasp the game of fetch. What places in the the United States have a clean collection of sit-down restaurants and sports bars? Oh, right—every place!! What places have bars like Ruby's? None. Ruby's is one of a kind. So are the other businesses. They're Coney boardwalk businesses. They're irreplaceable. A sports bar isn't. Applebee's isn't. And there's more. "We don’t have the same vision," Ferrari said of the vendors he was shutting down. "They like the way it is, and we don’t." That's clear enough. Of course, his assumption is that his vision is the correct one. He's mistaken. Saw this little green triangle in Sheepshead Bay. Wasn't even sure if it was a Greenstreets deal; there was no sign saying so. 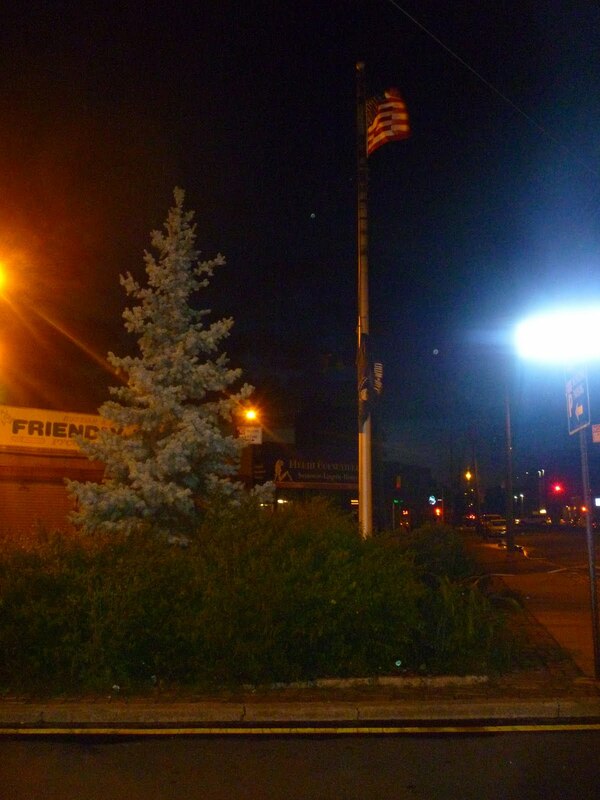 Hidden around the base of the flagpole, surrounded by brush, were some dark squares I first took for shards of bluestone. Looking closer, I realized they were worn plaques honoring various Bay citizens. I didn't recognize any of the names except this one: Vince Lombardi. The Green Bay Packers coach? Namesake of the Super Bowl trophy? Here? Oh yeah, I forget. He came from Sheepshead Bay. He always did seem like a New Yorker. This curious establishment is in Sheepshead Bay. I'm pretty sure its life as a "Russian and American Nightclub" is fairly recent. But that classic neon sign speaks of a previous existence as an old style bar. I peeked inside one recent night around 10 PM. Not a soul in sight. Is Bruno's Mexican Cucina a Seattle landmark? I doubt it. But the downtown joint, on a dicey stretch of Third Avenue, it's so weird I feel I have to celebrate it. Such a strange cuisine mash-up. It's a pizzeria! It's a Mexican cucina! It's both. And it's a Margarita Bar! I don't remember the last place I say that advertised itself as a Margarita bar. Looking at the Yelp reviews, it's pretty clear the food here is bad. I wouldn't have guessed otherwise. But it's very cheap. And I'm thinking the joint has a certain dive bar appeal to some. Something must have kept it in business since 1974. I like this Yelper the best. She seems to have captured the crazy spirit of the place: "Overall, so bad it's entertaining except I had to eat it...What I bought: Chips & Salsa, Garlic Bread, Salad, 2 Calzones. Total: $30. Well, what to say, what to say... this place confuses the heck out of me, I half expected someone to jump out during dinner and say "gotcha!" or "you're on candid camera! "...We were so flabbergasted that someone could actually A) serve this stuff as edible fare and B) charge you for it! Avoid like the plague unless you want a hilariously bad dining story to share with friends - I have to give this place that much - it wins every worst dining experience story contest we've ever told it in. And for that: 1 star." City preservationists remember the Coogan Building. The structure, which once stood at the corner of 26th Street and Sixth Avenue, was an early victim in City Hall's long campaign to rid the Landmarks Preservation Commission of its teeth. The Coogan was built in 1876 for use by the Racquet Court Club, predecessor to the modern Racquet and Tennis Club on Park Avenue. Architecture historians called it a predecessor of the modern skyscraper. It had been granted landmark status in 1989, the Commission calling it ''an excellent and early example of arcaded, tripartite facade design, of the type later expounded by Louis Sullivan.'' But then, later that year, Mayor David N. Dinkins and the New York City Board of Estimate rescinded that designation. It was torn down a decade later and replaced by a 39-story luxury apartment building. Why do I bring up the Coogan. Because a couple days ago, I posted an item lamenting the fact that the City was auctioning off—to one single high bidder—all the contents of Williamsburg's Architectural Salvage Warehouse, which, from 1980 to 2000, "accepted the remains of demolished structures." A reader managed to get inside the warehouse and take a group of photos. 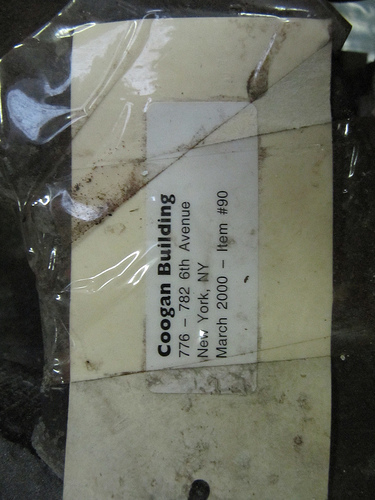 Among the shots was the above picture—showing pieces of the Coogan Building. "March 2000—Item #90." Here's how the Coogan looked in life. It's the impressive building in back. 143 Union is the center building in the trio of matching, four-story structures in the center of the north side of Union Street between Columbia and Hicks. I got some early information from a neighborhood vet that the store in the base used to be a florist. This photo shows that to have been the truth. A. Castiglia Florist, if I read correctly. This photo is from the 1930s, and my source was a kid there in the 1960s, so the florist was there a few decades. The fonts are super curious. But the name's even curiouser. And two spellings of "Clean"! On First Avenue and 74th in Manhattan for 30 years or more. This story in City Room infuriated me as nothing has in months. So, apparently, there's this warehouse out in Williamsburg that's full of rare, one-of-a-kind artifacts from New York history. A chunk of a famous building here. A sign or piece of furniture from a vanished business there. A section of the facade of the old Helen Hayes Theatre. A block of Indiana limestone marked NYB, from the old New York Butchers on 11th Avenue. 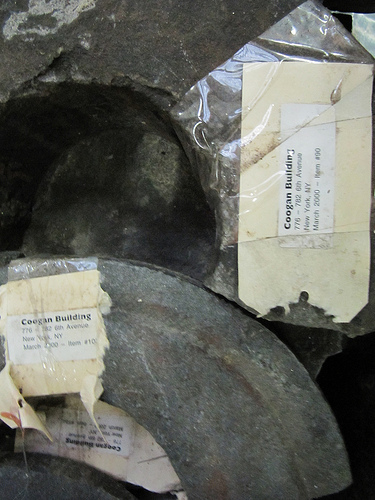 From 1980 to 2000, the Architectural Salvage Warehouse "accepted the remains of demolished structures: shuttered theaters, once-bustling slaughterhouses, even old signs from the post office at Grand Central Terminal." This precious detritus was then put in the Brooklyn building. Where it sat. And sat. 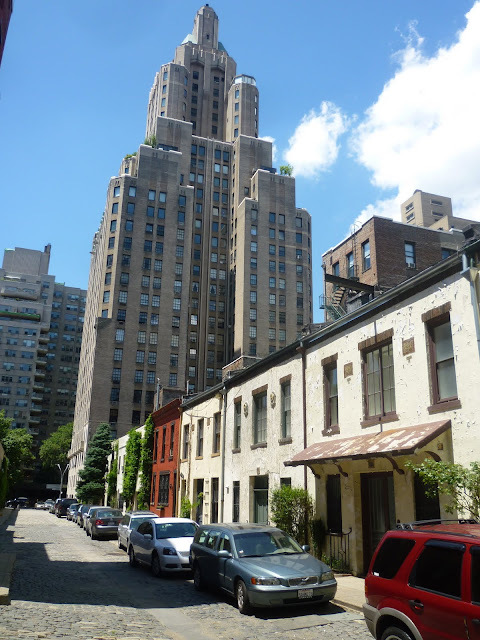 And now the Landmarks Preservation Commission—that completely sensitive and wise body that decides which old buildings can stay and which will go—is going to auction it all off. Auction it ALL off. The whole of it. One lump package. To one person. One entity. ONE! 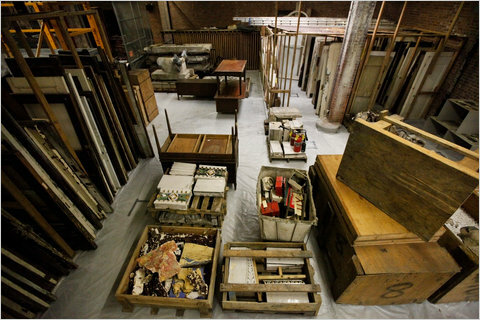 Why could the stuff not be auctioned off in pieces, or lots? That would afford people who don't have a lot of cash—but possess a lot of interest—the chance to claim some of these treasures. The kind of individual who would step forth to bid on a single item would most likely be an amateur historian or nostalgist (or blogger) who would nurse and lovingly preserve the artifact. Putting the entire warehouse-ful on the block means that only a super-rich party can buy it. And the chances of some millionaire really treasuring these things, or wishing to share them with the public, are next to nil. The bidder will flip the stuff, or sell it for scrap or hoard it in some vault. Pike Place Market, a public market that brings together 500 vendors every day along the edge of a steep hill leading down to the Puget Sound, is the spiritual heart of Seattle. It was founded in 1907. After the city threatened to tear the place down in the 1960s, a populist movement led by architect Victor Steinbrueck saved the property. (There's now a part named after him.) It's now on the U.S National Register of Historic Places and a federally recognized historic district. The are many stalls here and you can buy most everything (lavender anything; straws filled with honey). But mostly you can buy food, from vendors and from restaurants. Some of the sellers have been here for decades. Place Pigalle was founded in the 1950s. The Athenian Inn goes back to 1909, when it was a bakery. Three Girls Bakery dates from 1912. Lowell's, seen below, started in 1957, and has three levels looking out on the water. As for Loback Meat Co., seen above, the business no longer exists. But the sign does. As do many other fantastic signs, neon and otherwise. It's a feast of signage. Even the sign that tell you where the stairs and bathrooms are are stylish and flashy. 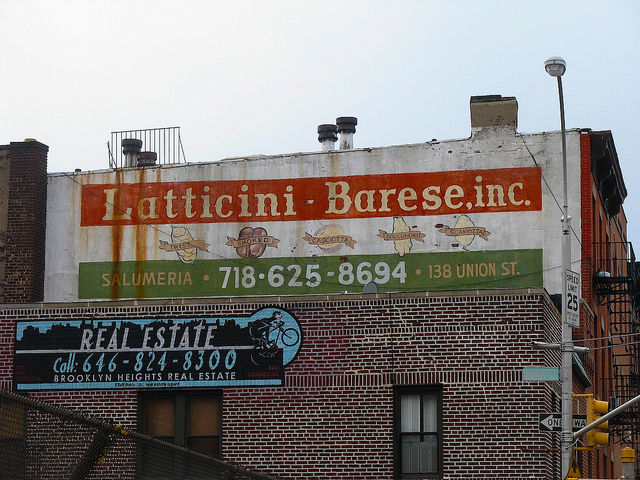 The old Carroll Gardens salumeria Latticini Barese closed up for good in 2002, after 75 years in business. But for those of us who loved the place, there was always the old painted ad on the side of 138 Union Street—the cheese shop's former home—to comfort us and nurse our nostalgia. It is simply, bar none, one of the best faded ads in all of New York City. And I've always been grateful to the real estate office that took over the space that they never painted over it. Now, it might be in danger. The real estate office has moved out (there never seemed to be anyone in there, anyway) and the building is up for sale, for just under $2 million. The building is not in a landmarked area, and could be torn down. While I think that is unlikely (there are six apartments inside, all occupied and three of them stabilized), there is the chance that a new owner would want that ad gone so as to make the building look "modern," or in order to be able to sell that wall space to another advertiser. Land owners and developers are not sentimental. To destroy that work of old world art would be a crime. 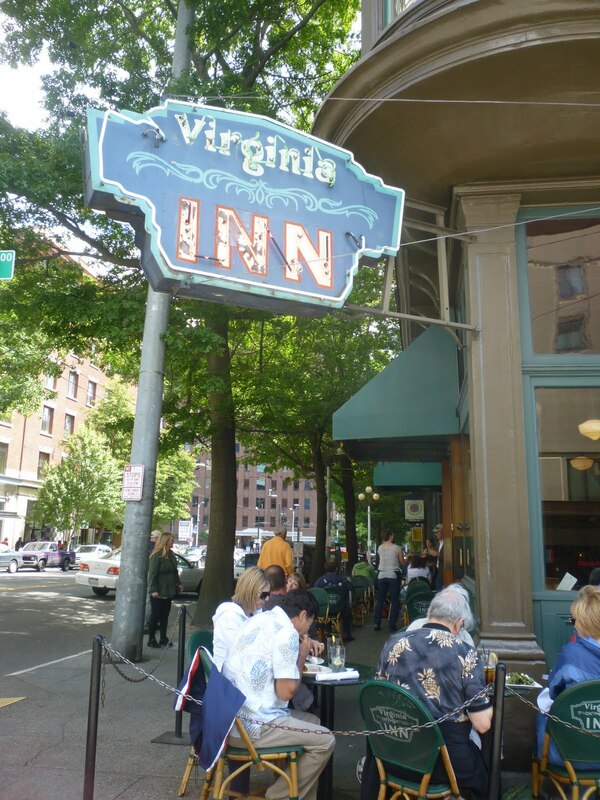 The Virginia Inn is older even than that market. This corner was a bar, called the Virginia Bar in 1903. During Prohibition it was reportedly a cardroom. Irritatingly, the website for the current restaurant only talks about the joint's history from 1981 on (aside from saying it had a "colorful Skid road history"). That's when Patrice Demombynes and Jim Fotheringham took up ownership. They converted it into a casual French bistro and bar, and earned a reputation for fostering art exhibitions. Aside from the great neon sign, and the bar, which looks on the oldish side, the Virginia Inn has a fairly contemporary look inside. The floor plan has altered; the place expanded into a neighboring storefront recently. I've read accounts that say it's been in "almost continuous operation." Almost. Perhaps the hiccup in time was Prohibition. But I'm pretty good at sniffing out former speakeasies. And the Virginia feels like on. In 2008, police found some old bones in a crawl space below the Inn, but it was determined that they weren't human remains. Below is an picture of how the bar looked in the first decade of the last century. At that time it was owned by two men called McNamara and Herdman. Not sure what the boat nonsense is all about. Probably something to do with the appalling state of the street. Imagine a frontier city having dirt roads and Seattle weather. A prescription for year-round mud. I don't stroll down Washington Mews much. 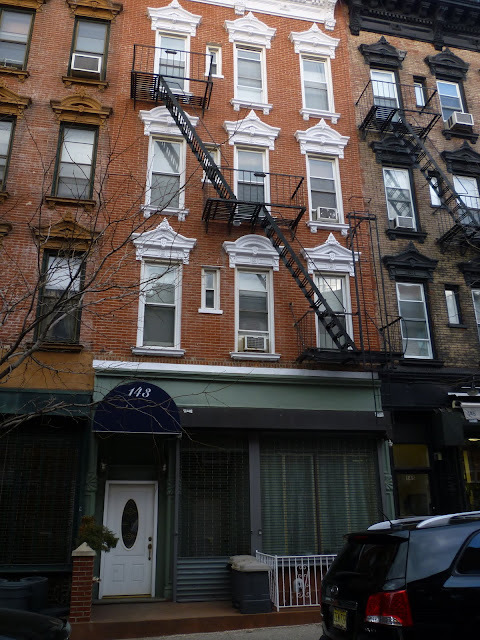 Though the ancient alley, north of Washington Square Park, is beautiful, it reminds me too much of New York University's bottomless appetite for real estate; so many of these former carriage houses are now owned by the monster, Village-eating college. Still, it's a shame to deprive myself of such quiet beauty. So the other day I accepted the invitation offered by the open gate and walked the length of the Belgian-blocked path. Walk Sixth Avenue between 14th and 34th Street and you may notice something different about the older buildings that line the street. As often as not, their second stories are not just blank brick face, not apartments, but what seem to be elevated storefronts. That's because they were indeed built as storefronts. Until 1938, this avenue was dominated by the Sixth Avenue Elevated train. The train thundered right by the second level of every building, making that story very valuable real estate. Every straphanger couldn't help but notice the stores that passed by the train windows. Today some of these spaces are still in use as shops. Others are not. The overall visual effect, however, is, to me, very attractive, in an utterly prewar way. 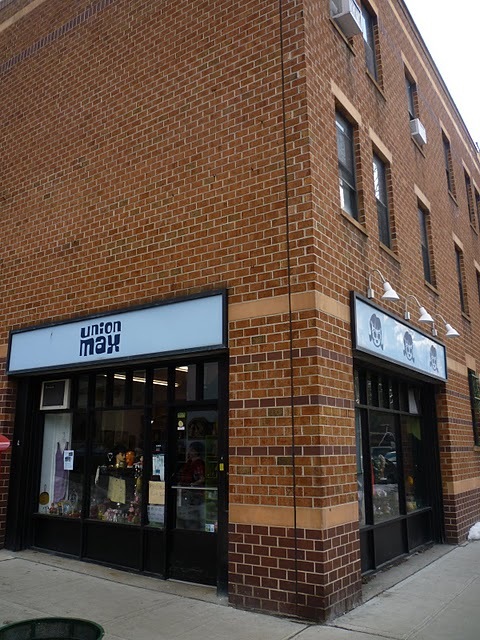 The sign at 1390 Second Avenue says Klausner Supply. But you look at the display in the storefront window and there are no plumbing fixtures. Just a lot of frou-frou pillows and drapes and other accoutrements of interior design.